Caracals are native to Africa, the Middle East, Central Asia, and India. They are known for their large, black tufted ears. Caracal in Turkish means “Black Eared”. Caracals are fierce predators who hunt birds and can take down animals up to three times their size. The average lifespan for a caracal in the wild is 8 to 10 years. In captivity, they can live 15 to 18 years. Caracals are 23.5 to 36 inches long and can weigh between 9 and 42 pounds. 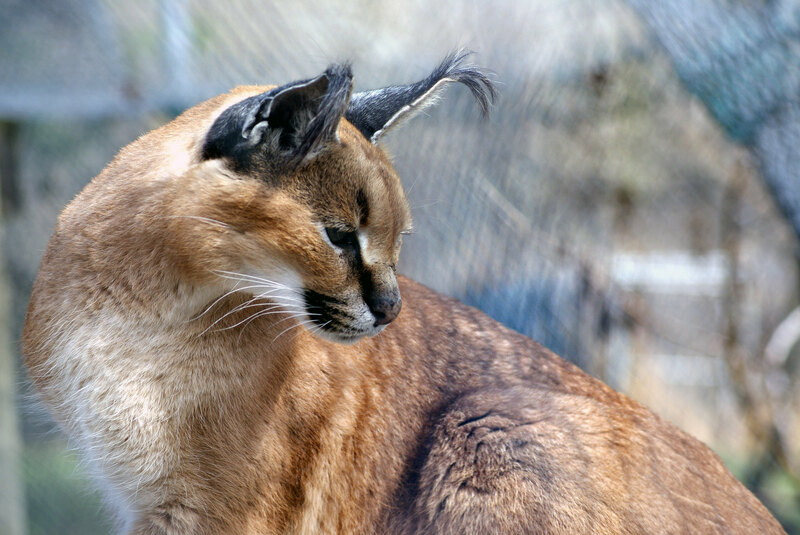 Male Caracals are typically larger than females.  They have shorter tails compared to most cats that average between 9 and 12 inches long. Caracals have longer and more muscular hind legs than front legs which allows them to jump up to 10 feet vertically. Caracals are usually tawny and reddish in color; however, a few melanistic (all black) caracals have been spotted in the wild. Caracals have black tufted ears and white spotted stomachs. Caracals are solitary cats that only come together during mating. Mothers care for their young up to a year, then the kittens leave in search of their own territories. In Africa, caracals are known as “Little Lions” for their fierce attitudes and aggressive nature. Caracals are nocturnal hunters that prey mostly on small mammals, but they are capable of taking down prey as large as an impala and antelope. Caracals live in Africa and over into India in a variety of habitats including woodlands, savannas, and semi-deserts. They live mostly in arid habitats with some rainfall and cover. Caracals primarily live and hunt on the ground but have been known to climb trees to escape danger and have been spotted fishing in streams and rivers. A caracal will typically remain in its territory for its entire life. Female caracals have smaller habitats than the males. Caracals are often killed by farmers because they are a nuisance and will kill livestock. They are also killed for their fur and meat. Habitat destruction and deforestation for farming also threaten caracals. Caracals are native to the majority of Africa, the Middle East, and even parts of India. Caracals eat a wide variety of mammals. They primarily eat small mammals, including mice, rats, hares, and hyraxes, but have been known to take down prey much larger than themselves. Caracals are capable of taking down prey as large as an antelope and impala. They also have been witnessed attacking an ostrich that is lying down. A caracal’s gestation period is approximately 2 to 2 1/2 months and they have between 1 and 4 kittens per litter. Kittens are weaned from their mother around 10 weeks and begin to eat meat at this time. Caracal kittens remain with their mothers up to a year before leaving to find their own territory. Caracals are primarily solitary, though pairs have been known to live together for a significant amount of time. Caracals in the wild typically live between 10 and 12 years but in captivity can live 16 years or more. Caracals have a wide range of sounds, including hissing, growling, barking, purring, and snarling. Like other cats, caracals mark their territory with scent. They have scent glands on their cheeks and will rub against trees and bushes to leave their scent. They will also spray their odor on their territory. Additionally, scratching trees not only sharpens their claws but also leaves their scent behind. 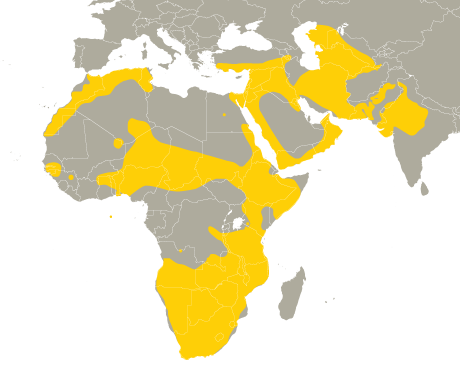 Humans are caracals' primary threat. They are often killed without restriction because they are seen as a problem animal. Even though they are able to be hunted in much of their range, they continue to thrive. Their stealthy nature prevents them from being seen by humans most of the time. Caracal comes from a Turkish word meaning "Black Eared"
In Africa, caracals are sometimes referred to as the "Desert Lynx" or "Little Lion"